Home/How To, Inspiration/In Scandinavia, they understand (indoor) greenery! This year, the biennial excursion of the European Interior Landscaping Organisation (EILO) was held from Thursday, 29 September through Saturday, 1 October in Copenhagen, Denmark. In all, forty-seven professionals from eleven different European countries took part in the event. On Thursday, we glimpsed the future, via several short presentations, chock-a-block with digital and/or technological innovations. 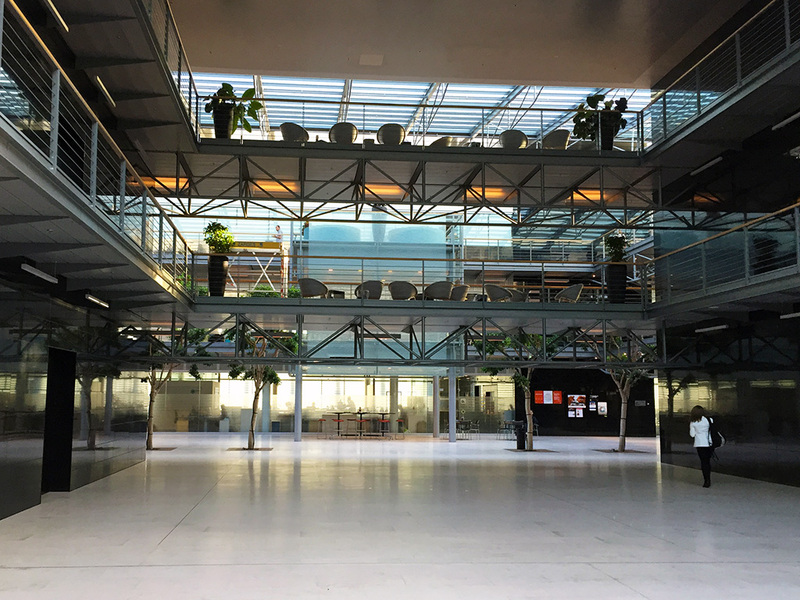 On Friday, we were taken to six amazing projects in Malmö and Copenhagen. And on both days, we saw what’s possible when greenery is really understood. IT expert Martin Dal kicked things off. He explained how, as a “lazy IT student,” he had got the idea to program a little meter to peep when his plants were in danger of dying, and how this in turn had led to his founding Spiio, a company that specialises in the development of measurement probes which interior landscapers and their clients can put to a variety of different uses. Martin demonstrated how being kitted out with sophisticated measurement devices not only helps greenery projects consign frustrating surprises to the past, but also puts new types of data at their fingertips. Problems with water provision? Is a bed doing poorly? Is there too little light? Interior landscapers can now install a range of ‘alarms’ and either obtain such facilities as a service or acquire them through purchase. 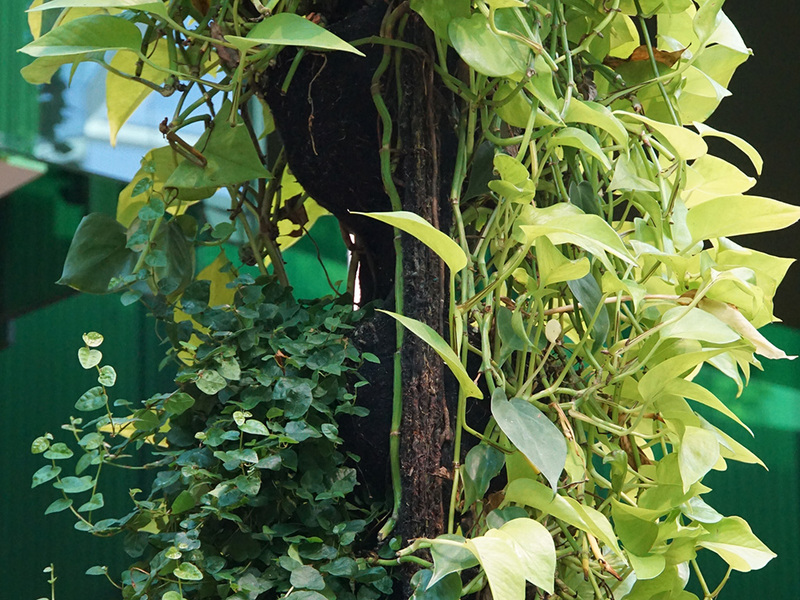 Environmental technologist Niko Järvinen, of Naturvention, explained that, in developing the Naava, it was not so much a plant wall they had created, but a “biological air purification device.” With it, Naturvention guarantees 100% pure air. Naturally, this does still involve a green plant wall, but an extremely sophisticated one, both in terms of structure and composition. According to Niko, it’s above all the roots – or to be even more precise, the microbes – that do the work. 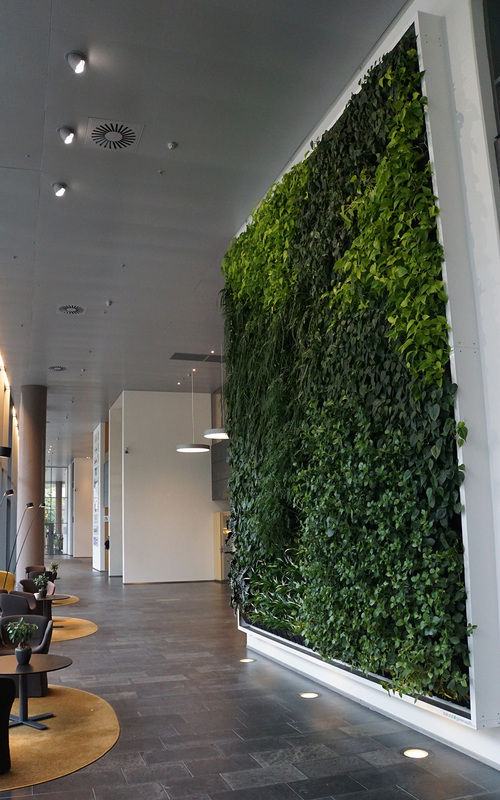 An ingenious way of letting the air pass by the roots makes it possible to create green walls that can purify 100 times as much air as conventional ones. The first versions of the wall, Niko explains, were a bit drab in terms of planting and not terribly flexible in terms of installation, but with the newest ones, the creative possibilities are virtually unlimited. ‘Pecha Kucha’ is the name of a presentation system which enables slides to flash by in rapid tempo (20 slides x 20 seconds = 6.7 minutes). Near the end of Thursday afternoon, three greenery suppliers each gave a Pecha Kucha presentation about the latest developments at their companies. Shari Oostrom showed how Mobilane’s products for the green-wall market keep getting easier to install. Sadig Alekperov from Green Mood showed the wide range of applications for preserved greenery – in the form of mosses. Finally, Karsten Haak from pot giant Lechuza presented the latest trends in his field. Ulrich Grönning from Natural Greenwalls took the group on a tour of the day’s first destination: DONG Energy. 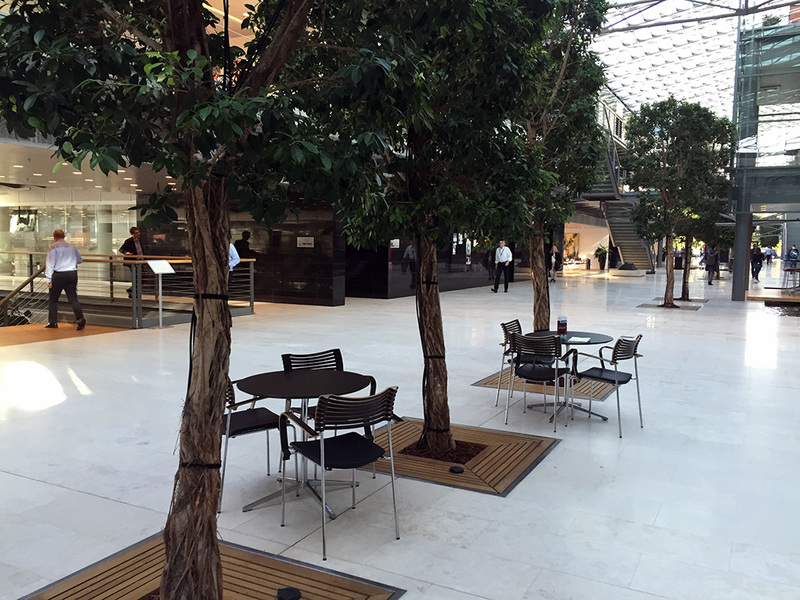 The company’s premises are divided into two parts, with several ‘atrium roads’ between them, complete with trees and benches. In the winter, the trees are all illuminated. In spring and summer, it’s like sitting out-of-doors. 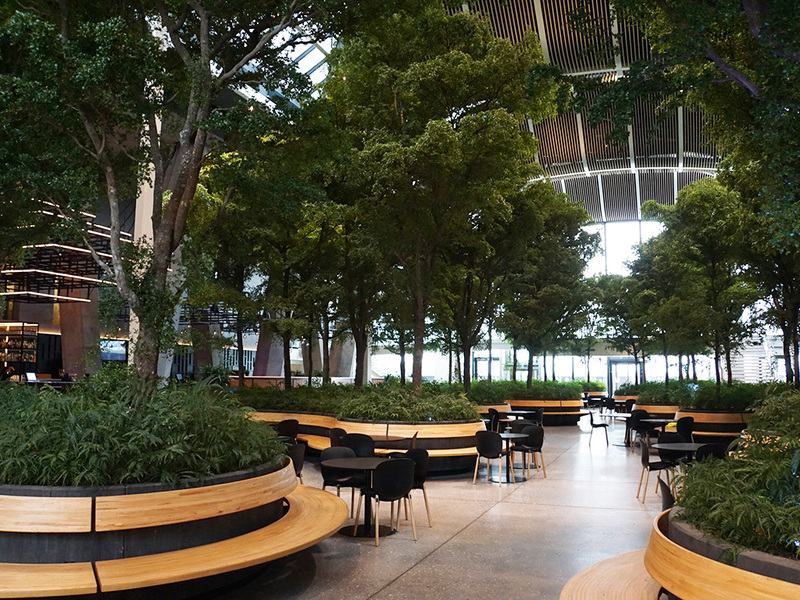 But the atrium area is not there just for beauty: it also forms an essential part of the complex’s air-purification system. 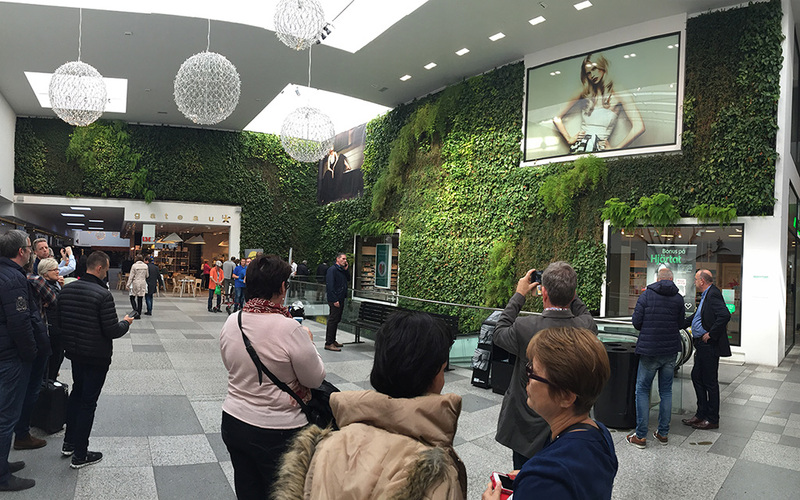 In Malmö, Sweden, at the other end of the famous Bridge, Hans Anderson from Green Fortune took us to two shopping centres of the future. The first was the large, ultra-modern Emporia Shopping Mall, which was built in parallel with the construction of the bridge itself. While the highly photogenic plantwires from Green Fortune drew most of the attention, the Plantcube, busily photographed by all of the participants, also clearly captured the imagination. Located in the heart of Malmö, Caroli is, with its historic allure, a shopping centre of an entirely different type. 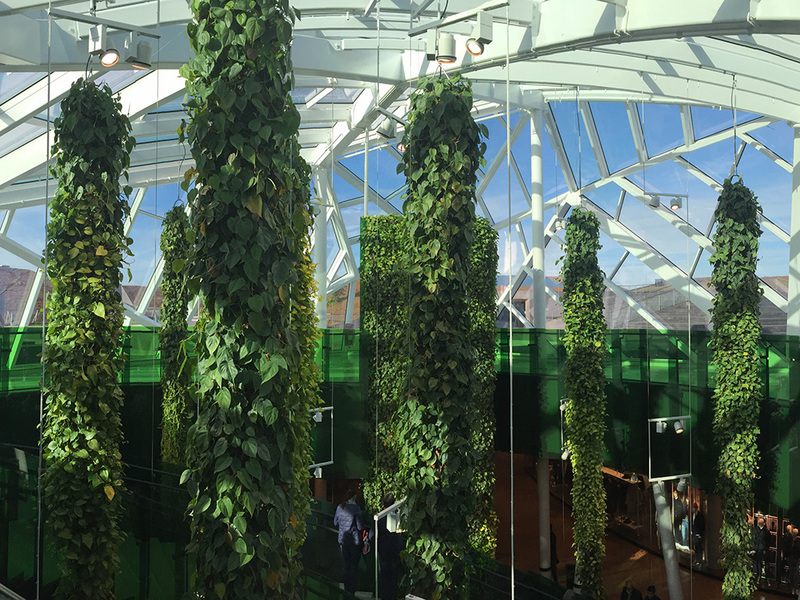 And, appropriately enough, the immense green wall from Green Fortune adorning Caroli’s heart seems to ‘breathe’ historic elegance. The atmosphere was akin to being outdoors, indoors. But it was also like being in an elegantly appointed hall – while actually standing near the exit of a supermarket! While enjoying a 100% sustainable and biological lunch, we bumped into Ulrich Grönning again – this time at the premises of his client, KLP Eiendomen, where he presented his green wall. The photos were taken after Ulrich had just added a segment with Spathiphyllum plants, whose boxes can be replaced individually. 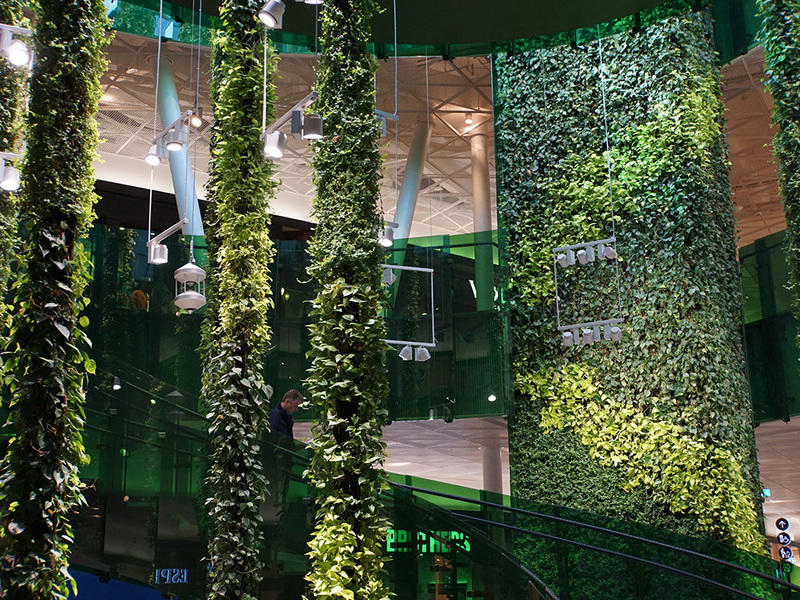 The greenery for Copenhagen’s Bella Sky Hotel was provided by Deichmann. Here, green is omnipresent in the form of colossal (250 m2) imaginatively planted walls and a more than twenty-metre-tall tree. 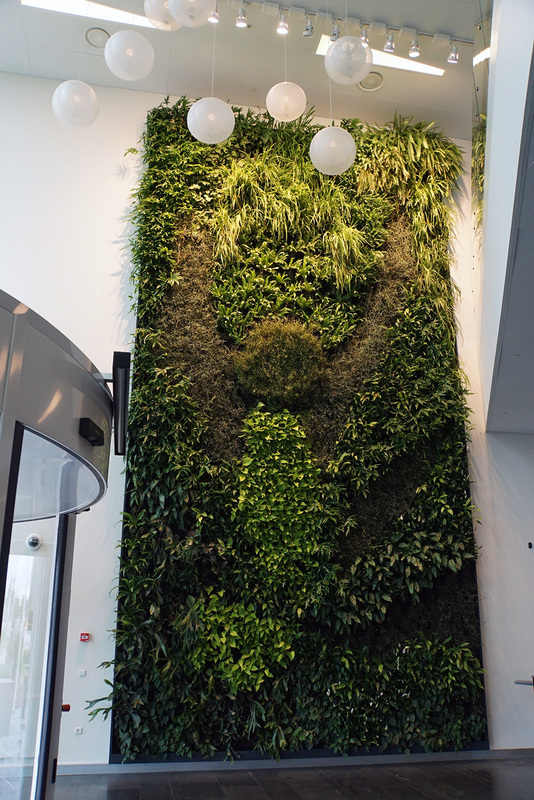 The Bella Sky’s manager told us that, without exception, all of the hotel’s guests react positively to its green walls, and indeed generally prefer to sit right next to them, and added that, in his view, green tells the whole story of sustainability without the need for words. 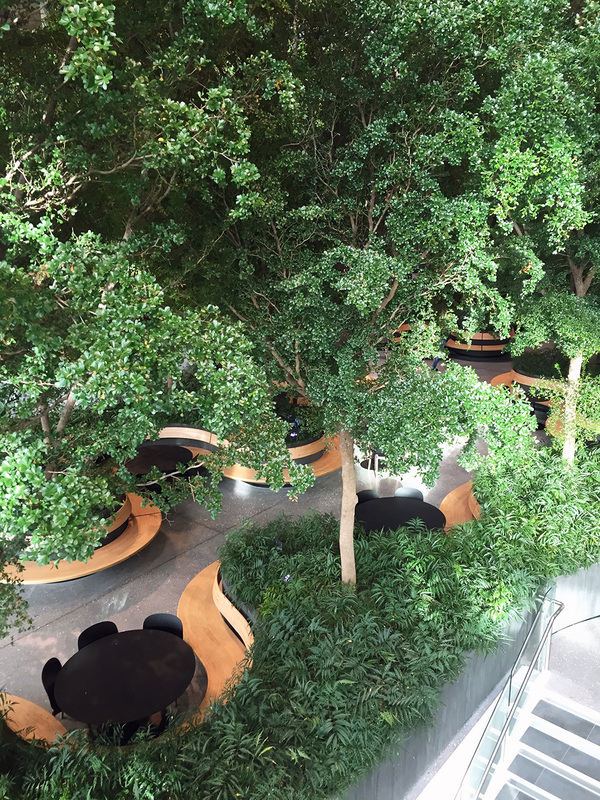 Oxygreen was the company behind the authentic feel of the ‘wood’ in the middle of the foyer of Copenhagen’s Crowne Plaza Hotel. The hotel’s manager explained to us that, while the wood did not come cheap, the value it has yielded has by far exceeded their investment. One obvious result is the message it gives, namely that Copenhagen Towers takes sustainability seriously, but a particularly pleasant outcome has been the fact that the hotel’s ‘indoor wood’ has become a veritable magnet to groups and conferences. This actually summed up for us what had been apparent throughout our tour: in Scandinavia, where large hotels and shopping centres are now competing with one another to see who can devise the most exciting green experience, they clearly understand the enormous commercial potential of green! Green buildings really do need green!